It looks just like in the picture. It gives off beautiful lighting from all the crystals. I bought the smaller one and have it in the guest bedroom. The best part is that it’s all put together for you. Nothing for you to do but hang it. Decadent dazzle effortlessly transforms a lackluster room into a place of effulgent romance with this luxurious flush mount. Intricately exquisite glass beads catch the light and cast a glamorous glow around the room evocative of a bygone aristocratic era, making this antique bronze piece an opulent choice for any space. I ordered hoping for the best. It arrived on time it didn't take hubby long to install it at all. It now graces my entryway foyer. I'm not sure what some reviewers are talking about as far as not sure how to change light bulbs. This light fixture works like every other one where you unscrew the bottom finial and pull down the decorative bowl portion of the light and change the bulbs. This light sparkles and looks very rich. It casts pretty patterns on the ceiling and goes beautifully with my dark bronze finish crystal chandelier in the adjacent dining room. From the picture, I wondered if the light bulbs would be very obvious/viewable - they aren't. 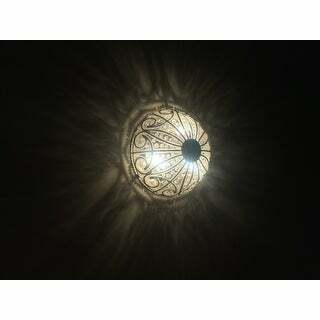 I've included a picture of my new beautiful light. I love it! It's perfect! 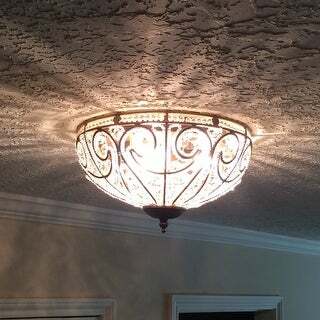 We purchased this lighting fixture to go in our hallway. We have very high ceilings and the hallway itself is dark. We wanted something that casts enough light yet was unique and elegant. This fixture did not disappoint. It is absolutely stunning and we have received so many compliments. When the light is turned on, it illuminates the area perfectly and casts beautiful shadows on the wall and ceilings which we love. We love this light so much we bought two. Love! Easy to install light weight and beautiful. I was concerned about the Stitching around to the beading, Afraid it might look tacky but it doesn’t at all. The light is pretty in my guest bedroom. I used 40 W LED chandelier style light bulbs and it’s perfect. No need for a dimmer switch. Recommend! Ok Shoppers!! Really, this item is so beautiful in place that I've just purchased my third one so in every room but the bedrooms this flush mount covers the source except for the fans and actually I have the fan over my dining table and you may think gaudy but no ... everything is just the right size and the spacing between them prevents a palace/flashy appearance!! I am tempting to get the larger ceiling fan for my livingroom but after this mount is put in place I will make that decision! I can't say enough times how awesome these are ... Once I make a decision to put the ceiling fan in the livingroom I will edit my review with pictures! This is a beautiful light fixture. This Claire Flush Mount is beautiful. I have the matching chandelier and love it as well! 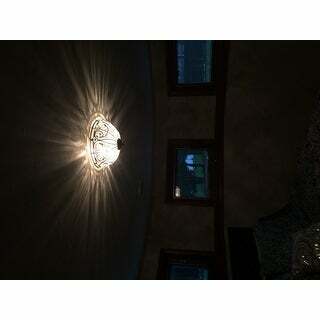 This is a stunning flush mount light that I installed in my foyer. The light makes a beautiful pattern on the ceiling and it is such a nice, warm atmosphere that it created! Very nice quality for a great price. Just love it! Exsquisite flush mount with unique illumination. Absolutely beautiful! I was really nervous about buying two of these to go in the hall of what will be our forever home. We are not "flashy" or "glitzy" but more *** style people. I wanted something different with a bit of shine, but still enough metal to make it strong looking, and this was just the light! I could not be happier with my decision. I would definitely recommend this item. Install took about 15 minutes. Very nice price for the detail. Finally got this light installed after not having luck with other fixtures ordered. 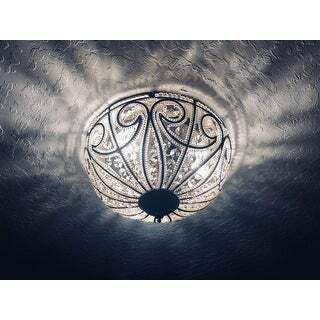 But I absolutely love this light it is gorgeous! It does reflect off the crystals and projects onto the wall. So just be mindful of that if that's not something you would want. This is a beautiful fixture. No regrets on this purchase! 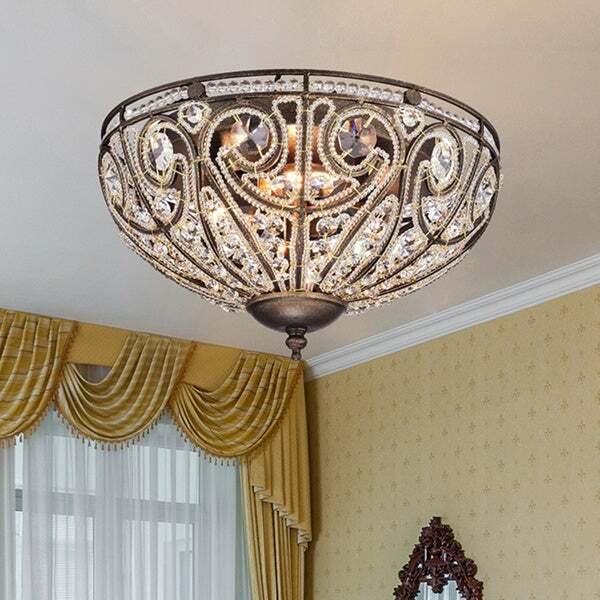 Awesome, This fixture gave my bedroom an EPIC sense of Victorian style. Beautiful! Love the shine on ceiling. Husband had no trouble installing. Expensive, should definitely include the Bulbs!!!!!!! & does not. This product is absolutely beautiful, elegant and unique. It is worth every penny! This product has transformed my kitchen to a higher level of beauty! I purchase the light after seeing it at an retail store for much more. The light is elegant and well made. The color goes perfect in my foyer area. I would recommend this light. Gorgeous light. Also bought the matching fan for a historical home. Looks very elegant in my foyer. I have had so many complements. Could not be happier. It looks amazing! The first one I purchased there was a piece broken. However, Overstock had amazing customer service and replaced the light immediately. It works great an looks beautiful. Despite the little mishap I am very satisfied with my experience and the product. 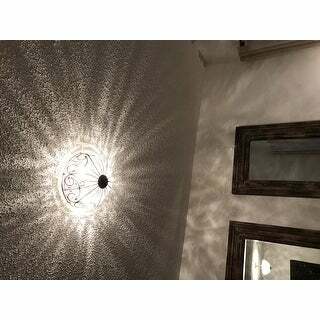 We put this light in the Hall, entrance of our house and it is a great effect. Very elegant light and very original. We have received tons of compliments so far! I wasn’t sure when I bought this fixture online if it was really what I wanted. I bought it for my main hall. It turned out to be beautiful and it puts out a nice amount of light. The picture online doesn’t really do justice! "Are the bulbs standard or candelabra style?" 4 candelabra style, Iwent with LEDs at Home Depot. "Would this light be bright enough for a bedroom overhead lighting?" Yes, it uses three 60W bulbs for ample lighting. "I just wanted this to put to cover my lights. my silling lights are single about 8 by 8. does requires 3 lights? " This is a 3 light fixture. "Does this style come in a small hanging pendent ? I love the light and the ceiling fan but I need 3 matching pendents"
"Can you add this to an existing ceiling fan for the lighting"
No, it is ceiling mount only. Over Stock does have a ceiling fan that has this type of light on it. 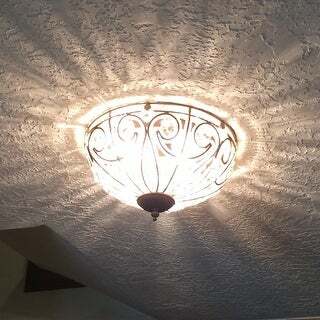 Just to add, I love this light fixture and have the fan but have not had the time to install. "Is this light dimmable? Will be able to use with a dimmer switch?" 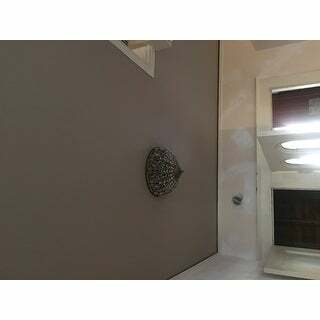 My son was able install this light fixture and he use a dimmer outlet it's beautiful. "You still have the light showing with beads/crystals and one picture without them. Still don't know which one would arrive. These pictures were supposed to be corrected." I ordered this light and it comes with the crystals attached. Hope that helps.